People from all ages, fitness levels and exercise expertise who have begun doing Pilates ball workouts say that they have experienced and seen for themselves the improvements in their muscles in terms of strength and flexibility. As a result, the targeted muscle groups gain more range of motion thereby reducing the risks of pain and injury. One of the reasons why many feel aches in their back and neck is because the muscles have lost strength and endurance due to increasing fat deposits. This is more obvious to those people who are obese and have bad posture because their core muscles have gotten weaker over time. This can be solved or prevented by joining Pilates classes which are designed to help you develop your body's core muscles. You will be able to build coordination and symmetry in the body by doing stretching and strengthening exercises. With proper supervision, you will be able to correctly perform the right exercise routines in Pilates classes in Canton, MA. These classes are not exclusive to the athletes or sports enthusiasts. They are also perfect for those people who have sedentary lifestyles and spend most of their time at work, sitting for more of the day. Pilates helps in promoting body awareness and achieving body leanness so you can maximize all its functions, allowing you to do what you want and need to do in your daily lives more effectively. 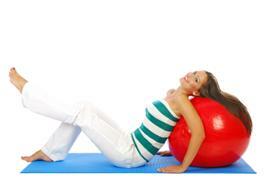 To join the Pilates ball workout classes at Answer is Fitness, contact us.